Managed SEO Services Toronto. We can help turn-on the spotlight! We can help turn-on the spotlight. among a sea of other local Toronto websites. As an integrated part of our web design service we build SEO-friendly web pages from the ground-up, and create content placeholders to hold your SEO tags. But successful SEO is MUCH MORE than that. Your new site will be a solid foundation to help you grow your network, build your leads funnel and increase your sales through our special SEO and Digital Marketing programs. We bring to you qualified leads particular to your market. Ideal for Insurance and other Corporate firms. We follow Search Engine Rules (“Ethical SEO”) and use optimization strategies that focus on human audiences. We specialize in SEO Services in Toronto, but we can compete in other locales with equal success. Comprehensive website audit. If we have developed your web design, we have already performed a preliminary audit for free. Competitor analysis. Who is ranking well. Keyword analysis and selecting the right targeted keywords. Page optimization, relative to your competition. Weekly reports in your mailbox showcase the performance of your site and the progress of our work. Can you make my EXISTING site show up high on Google? We can try, that’s if your site is a modern build and passes our tests. We will require access to the admin section of your site. If your site is an old build (four or more years) first consider rebuilding your site with one of our web design programs. Is it true that tweaking META tags on my site is really ALL I need to do get ranked highly? No, unfortunately this is not true. Search Engines will judge and rank your web pages using much more information than just your META-tags. In fact, these days META-tags play little – if any – role in ranking your web site. Think in terms of visible content on your pages, and make sure that this content is relevant to the subject matter of your page. (We can help write your web content.) Focus on pleasing human visitors instead of putting all your efforts in satisfying Search Engines. Will the results of a successful campaign last? Yes, at varying degrees, depending on the nature of your business and how often its parameters change. Each campaign studies the on-line “environment” around your subject-matter at the time of the campaign. As new competitors in your field join the Internet or old ones updates their websites and strive for their own Internet Marketing Campaigns and advertising, it is only natural that web page rankings will fluctuate. However, once a campaign is successful, you can maintain high ranking by keeping your content fresh and up-to-date, by writing new web content and trying to create new link relationships. If in the future your website changes substantially or your online competition has changed dramatically, you will have to redo the SEO campaign or subscribe to our Digital Marketing program in order to capture the parameters of the new environment. In short, it is believed that Google puts new web sites “on probation” inside a “no-index” zone called The Google Sandbox, until the sites’ owner prove that their sites have real substance and add value to the Internet population. Using this methodology, mostly found on newly-registered domain names, Google also tries to weed-out any suspected Spam sites. Such probation periods might be as high as 8 months. During this time Google displays little or no ranking results for the underlying website. Why do you bill for Search Engine Optimization if I can do this for free? Achieving high ranking is not only a matter of sending your web site address to search engines or tweaking a few META tags. We go through a pain-staking process of finding the correct set of keywords for your business, we perform a competitive analysis, we optimize each of your selected pages for your specific keywords in relation to your competition and more. In addition, we adjust the content on your web pages accordingly. 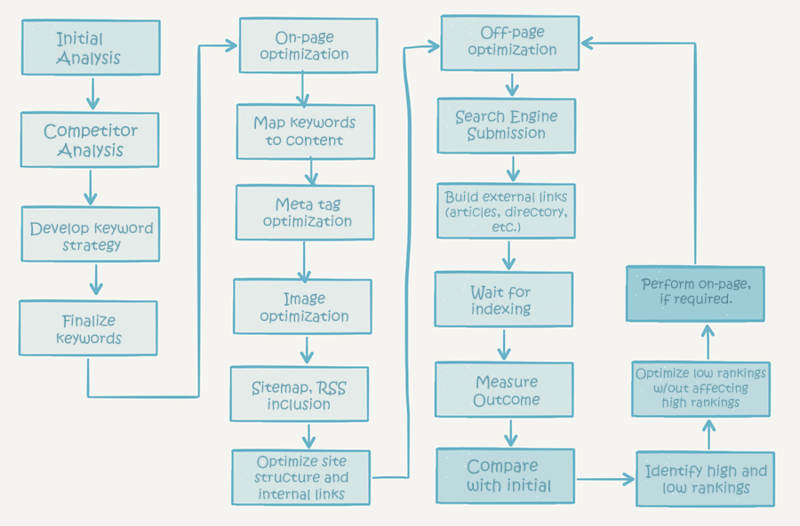 Please see our SEO Process graphic at the bottom of this page. Combine our SEO service with our Digital Marketing service for an even more comprehensive solution. Do you use any ||aggressive|| or illegitimate techniques? No. We do not use any illegitimate or illegal SEO techniques, or any actions that might jeopardize the placement of your web pages or reputation within a specific Search Engine. We do not try to trick Search Engines. Our methodology utilizes only White Hat techniques, where our core objective and target (other than fine-tuning the technology on your website for SEO) is to increase brand awareness and lead generation. What other factors affect SEO? A well-structured, SEO-friendly website is of paramount importance. Optimize your content for SEO and study your competition carefully. Also, make sure your host your site on a high-performance business web hosting infrastructure and pay particular attention to your site’s speed on all kinds of platforms including desktops and mobile devices. See our notes on how to Boost Your SEO with Better Site Speed. Our Managed Search Engine Optimization and Digital Marketing services are not just some software gimmick like we see popping up all over the web with dubious guarantees. Ours is a bona fide, completely legal proprietary selection of tools, strategies, procedures and methods that combined together deliver a Search Engine Ranking success for our client. Note: Project component “Build external links (articles, directory, etc. )” includes manual submission to only a select number of related directories. See our Digital Marketing service for a deeper approach, which includes new article authoring, social networking management and much more. 5 steps to quickly tell if your website can turn visitors into customers. How to fix. Refresh – Rethink – Get up-to-date. Expand your business. We would love to hear from you and help you build the right SEO and Digital Marketing program for your company.